For your final task, you need to get a Makey Makey from the Technology Cabinet and hook it up to your computer. If you need to refresh your memory about how the Makey Makey works, click ​HERE and read the 'How To' page. Once you are comfortable with using the Makey Makey again, your job is to use various materials (ex: apples, bananas, coins, tin foil, Play-Doh, etc.) to control the mBot. If you touch one thing, the mBot will move forwards. If you touch a different thing, the mBot will move backwards. If you touch a third thing, the mBot will turn right. If you touch a fourth thing, the mBot will turn left. If you touch a fifth thing, the mBot will play a series of beeps. 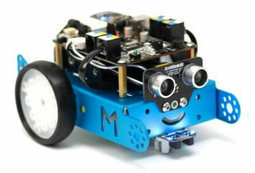 As long as you are touching a sixth thing, the mBot's LEDs will continually flash different colours. ​​Of course, you need to record one more video on your video camera to document what you have done in this final stage. At the beginning of the video, one of the group members will state exactly what is supposed to happen and then you will record it.